Where to start….when i first thought about writing this, i was saying things like (to myself of course) “This will be easy” and “Anyone can write a blog” – clearly when it comes down to it I’m full of s**t!! As this is my first post and basically about me and how amazing i am, thought it best to keep things short and sweet and hopefully not bore people to much and discourage them from wanting to read more things that i go on to write. So – I’m Danny…Umm Hello. It’s a pleasure to meet you! My blog will essentially consist of me telling whoever takes the time to read it, about my strange journey from being an Army Infantry Soldier of 10+ years to now starting out a career in Software Testing. The connection is hard to make but i hope to clear this up in the next couple of paragraphs so bare with me…. Straight into it then so you can get back to more important things like basically anything else….I joined the British Army in 2000 as a skinny, long haired boy and emerged 11 years later a borderline chubby, short haired man. 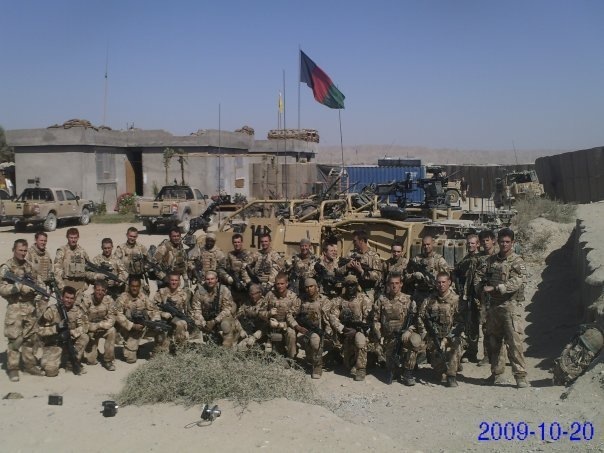 Absolutely loved my time in the forces and i defended our great nation in a number of…let’s say, some non package holiday places like Kosovo, Northern Ireland(The part i went too), Sierra Leone, Iraq and Afghanistan to name a few. As part of The Rifles, every man is encouraged to be “A Thinking Rifleman” i think this is only to a certain extent, and only if you keep most of your thoughts to yourself. “Why are we painting the brown parts of the grass green sjt? !” would be a typical question asked before a high ranking officers visit…”Because i told you to” or “Because we are” would be the response. Not the in depth, clear and concise answer i was hoping for. It was at this point i know it was time to move on and that’s what i did – handed in my notice and served my last 12 months (seven of these delightful months were in Afghanistan) and moved onto to pastures new. Okay, finally to the Software Testing part – if you need to stand up, shake your arms and legs about, slap your face and wake up a bit then please do so I’ll wait…..ready!? Let’s get started – Basically i had no idea what i wanted to do and dossed about a bit (i was going to put “bummed about” but that would take this story into a totally different direction) after i left the forces. I took the resettlement package before i left, attended a few courses, i decided quite rapidly that these career paths were not for me. Submitted my CV to so many places that i forgot who or what job i applied for….not my proudest moment but i just wanted a job. Out of the blue i received a phone call asking if i wanted to travel down to Essex and do some Software Testing, i believe my response was something like “Do i want to do what in where?” – At this point i wasn’t aware of what Testing was, so naive it was unreal. I used all these different software products and i had no clue of how they were developed and tested before release. I arrived in Essex about a week later and started my Testing career – weird at first coming from a muddy, dirty, physical job to being placed in a small pen at a desk in an open plan clean office. Loads of new (some strange) faces looking at me and checking out the new bloke in town and probably thinking the same as me “What the hell is he doing in here, bless…he must be lost”. I just took everyday as it came and thought this is going to be a massive learning curve but I’m up for the challenge!! If they didn’t like me or thought i was some sort of mong they could easily get rid of me but it turned out that they liked the way i worked so i ended leaving 8 months later after a few contract extensions. The more i did the work and the more i spoke to the other testers and developers, i knew that this was what i wanted to do with my new life…my desire to learn and question things i didn’t know, all the time would lead me to new and interesting things and sometimes it was information overload but most of this was sticking in my head. I would finish work and continue to research words that i had heard and written down during the day just to keep up with the people around me. Yes, i made loads of mistakes along the way but i learned from these and made sure that i didn’t make these again the next time, everyday i was learning something new and my knowledge was continuing to grow and evolve. I went from someone who didn’t have a clue about how things worked to wanting to know how everything software related worked and i would be bad mouthing shoddy software and mobile apps. I love what i do and everyday is a learning day!! So that’s a general overview of me – what i would like to do is document my journey in Software Testing from the view of a Newbie, some of the things that i write might be interesting to a select few of you and then again maybe not but this is for me to put down my ramblings and make room in my brain for more information. Next post is going to be about my awesome day at Test Bash 2.0 and the wonderful people that i met there. Thank you for reading or just skimming through….all appreciated! What are you doing to learn more ? what resources are you finding useful ? what were your first steps ? why has testing attracted you ? Thanks for sharing Danny. Looking forward to hearing more of your journey! Looking forward to reading more of your journey. Welcome to the world of testing! This is one of the most interesting blog posts I’ve read on Software Testing in ages. Let me update your words for your new role! As part of The Test Team, every man is encouraged to be “A Thinking Tester”. I think this is only to a certain extent, and only if you keep most of your thoughts to yourself. “Why are we running scripts rather than finding bugs in new places, Sir? !” would be a typical question asked before a high ranking manager’s visit…”Because I told you to” or “Because we are” would be the response. Not the in depth, clear and concise answer I was hoping for. Just kidding, you can now answer back and be the thinking tester you want to be! Professional sceptics have to ask questions. Thank you so much for the comment! Appreciate you taking to time to read the post. Great spin on my words! Love it! Most welcome! It actually got me to thinking about those transferable skills, and I was reminded that our job in testing is to dispel the illusions that our test clients like to create for themselves – to be sceptical of claims (such as those made in requirements documents). I imagine in the Army there’s often a need to face reality and say what needs to be said – to state the facts and deal with what the case really is rather than wasting time on comforting fantasies. I can see the ability to do that, tactfully and clearly, as invaluable. So thank you for stimulating my post-TestBash tired brain! Thank you! Everyday is a learning day!! Really appreciate the comment! Nice start! and it is a very enjoyable read.. In my short career I’ve seen testers from different streams, but you are probably the first one from the battle field! 😀 Great stuff anyway. Keep learning and keep writing.. Thank you for the comment. Loving everyday at the moment, the testing community is awesome! !